Baku: Mercedes driver Lewis Hamilton seems to like the idea of competing for arch-rival Ferrari one day. Although he is committed to winning his third Formula One title with Mercedes, and his fourth overall, Hamilton admires the Italian manufacturer. Hamilton is in a tense scrap with Ferrari’s Sebastian Vettel, a four-time F1 champion. Vettel leads him by 12 points after seven races. Victory this year would see Hamilton match Vettel and Frenchman Alain Prost with four F1 titles. The British driver has 56 wins and is second on the list of all-time winners behind F1 great Michael Schumacher (91). With 65 pole positions Hamilton is level second with another F1 great, Ayrton Senna, and he could soon surpass Schumacher’s record of 68. However, he is already speaking enthusiastically about life beyond F1. Hamilton, who lives in Monaco, also wants to learn French. Meanwhile, Max Verstappen topped the times ahead of his Red Bull teammate Daniel Ricciardo as the main championship contenders struggled in Friday’s incident-packed opening free practice session. In hot conditions at the demanding Baku street circuit, the Dutch teenager clocked a best lap in one minute and 44.410 seconds to outpace his Australian teammate by 0.470 seconds, the two Red Bulls dominating the session. World championship leader four-time champion German Sebastian Vettel was third fastest for Ferrari in a session interrupted in the closing stages by a big accident when Mexican Sergio Perez crashed close to the castle walls. The Force India driver was fourth fastest in the session which was red-flagged to a halt to clear the debris from the circuit. Perez was unhurt in the collision, but his car was damaged badly and the right front wheel became untethered and bounced down away on the circuit without injuring anyone. Three-time champion Briton Lewis Hamilton was fifth fastest ahead of his Mercedes teammate Finn Valtteri Bottas, both men more than a second adrift of Verstappen’s pace-setting lap. The session began with an ambient temperature of 28 degrees and the track at 53 degrees Celsius, Frenchman Romain Grosjean quickly showing the power of his Ferrari engined Haas car in the heat on the long straight. 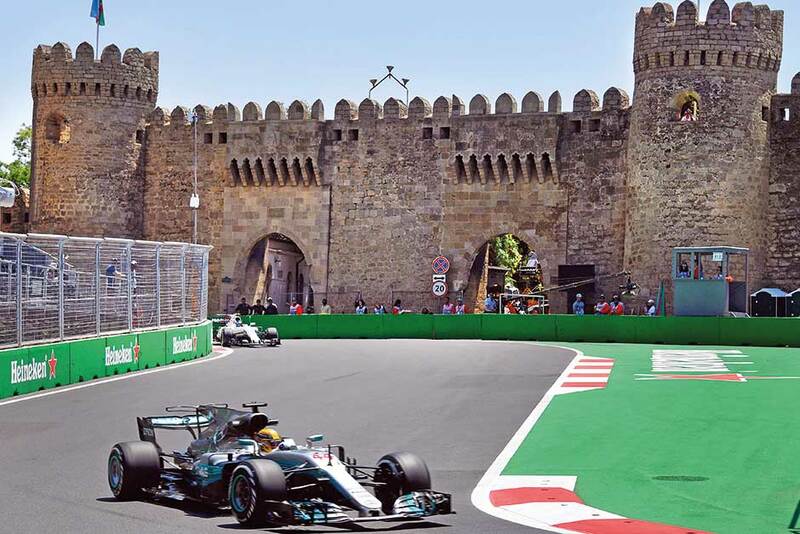 Brazilian Felipe Massa of Williams also topped the times as the lap-timings tumbled and most drivers endured spins and ‘moments’ on the slippery and tricky track that takes in part of the ancient city of Baku. Finn Kimi Raikkonen, in the second Ferrari, Bottas, Briton Jolyon Palmer of Renault and Grosjean all had big spins before Perez’s spectacular shunt, hitting a kerb to the left before losing control. Impressive young Frenchman Esteban Ocon was seventh in the second Force India ahead of Massa, Raikkonen and Russian Daniil Kvyat of Toro Rosso.